When you think of renting, you likely only think of the obvious, such as: homes and apartments, cars, or storage units. In fact, you’re probably unaware of the vast array of things that are available for you to rent. In a society that seems to place value on what you own, it can be increasingly difficult to keep up, and for the most part, the majority of the population doesn’t have the means to do so. Thankfully, there’s an array of companies launching sites and businesses for the sole purpose of providing you with the opportunity to rent various items in lieu of purchasing them. Instead of purchasing items you may only use a couple of times, save money by renting these six things. From formal wear and dresses, to designer handbags, jewelry, office attire, and every day outfits, you have the option to pretty much rent your entire wardrobe should you choose to do so. Sites like Avelle, Rent the Runway, and Le Tote, all offer subscriptions and services that allow you to pick clothing and accessories that you like, and then rent them for a one-time or monthly fee, the great thin is that they are able to provide you with holzuhren accessories if you wish. With constantly changing trends in the fashion world and the desire to maintain a fresh and up-to-date wardrobe, these companies offer you a brilliant solution to your fashion needs. After all, unless you have endless funds, the ability to be consistently purchasing new pieces for your closet, probably isn’t a habit you can keep up. Unless you absolutely love to host parties and get-togethers on a weekly basis, purchasing party supplies and decorations can be an expensive endeavor. Moreover, depending on the soiree you throw, you’ll likely need quite a few supplies. Think everything from tables and chairs to dinnerware to linens and décor. In most cases, all of these items add up quickly and are things you’ll probably only use once. That being said, if you have a bridal shower or graduation party coming up, you might want to consider renting your supplies instead. Look online to find local rental companies in your area. It’ll not only be inexpensive, but the company will do most of the heavy lifting and work for you as well. If you’ve ever gone snow-skiing or snowboarding, you’re probably familiar with the concept of renting your equipment. After all, the cost of skis, boots, and poles on top of transportation and storage is hefty, if you don’t have the opportunity to ski at least once a week. The same can be said for other sport and exercise equipment. No matter the sport, from skating to hockey to la cross, it’s never a bad idea to try out equipment before committing. Especially, if you have children who are either going to outgrow certain equipment or who would like to try various activities before committing. Moreover, if you’d love to try out an exercise machine or would love the convenience of having one in your home, consider renting locally or from a manufacturer to see if you like it or would get ample use out of it before spending thousands. This is one you might be familiar with, but if you’re not, you’ll be forever thankful for it. Anyone who’s ever taken a college class knows just how expensive textbooks can be. In fact, books for a as few as three or four classes can cost you hundreds of dollars. For books that are a part of your major or important to your education, it can make sense to purchase them. However, when you’re taking electives, you’ll often buy books you’ll most likely use once and be done with. If that’s the case, consider renting your books for a fraction of the cost. Companies like Book Renter offer your textbooks for rent at an affordable cost. Book Renter even provides free shipping when you’re ready to return them. This might seem like an odd item to have on the list, however, the cost of a funeral can be exorbitant, and there are times when you or your family might not have the funds to purchase a $4,000 casket in addition to all other mortuary expenses. If you’re considering having your loved one cremated, there’s really no need to spend thousands on a casket. Instead, most funeral homes provide you with the option of renting a ceremonial casket for viewing options. Furthermore, you could also rent a more expensive looking casket for the actual funeral and use a more inexpensive one for the burial. This can help you celebrate your love one in the way you’d like while also keeping you from spending money you might not have. Unless you work in a profession that requires the use of tools, like as a mechanic, craftsman, or construction worker, you likely don’t use tools every day. Moreover, tools are an expensive investment, ergo if you don’t use them often, you could use that money for other things. Depending on the tool and how often you put it to work, you might want to rent your tools instead. Next time you have a project, head to Lowe’s or Home Depot and browse the tools and equipment they have for rent. By doing so, you’ll have the tool you need without spending a fortune. For some reason, we tend to get the notion in our heads that we must simply own everything. 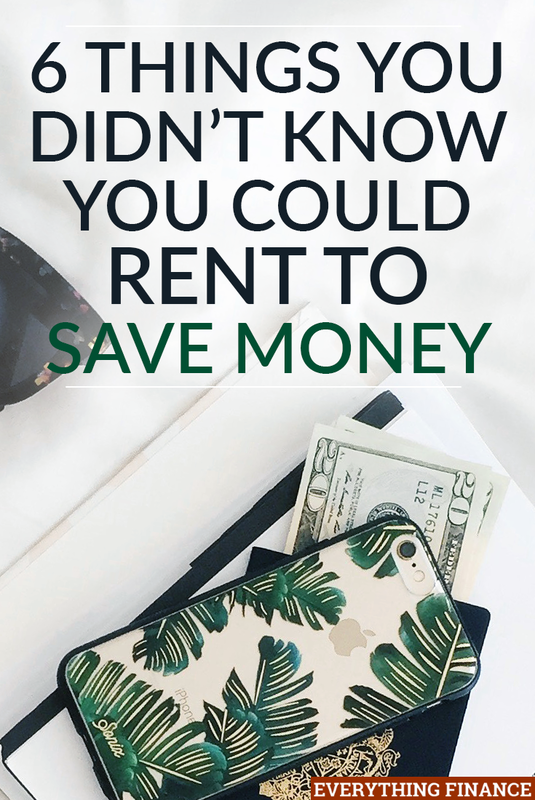 While that’s not to say that there aren’t some things that you should just purchase, like electronics or furniture, it is to say that there’s a whole wealth of items out there that you can and should consider renting. In a society that constantly focuses on the new, you’ll not only save money, but have the ability to keep many of the items you need on-trend and up-to-date. Have you ever rented some of these items? What has been your experience with rentals?